our current map is out of date; a new one is in the works! Map by Gothy, with perpetual thanks. The world of IDS is loosely defined, and creativity is encouraged. New landmarks and packs are constantly discovered and grown, allowing everyone to make their mark on our universe. Set on a fictional timeline based on the ice age, the bronze age, and the dark age, we include several fantasy elements that allow roleplay to be unique, varied, and flexible. An unstable climate causes rapid and dramatic geological shifts, allowing both transforming terrain as well as entirely invented species (plant and animal), but the physics and underlying science should be familiar. IDS is evolutionary and biologically fantastical, as opposed to simply magical-- although we do have a fair amount of whimsy. Ghosts and those claiming variations of a 6th sense are not unheard of, though the validity of these claims are shaky at best and left up to individual interpretation. The environment split by the Dire Strait encompasses a majority of the playable world; the east, a shadowy and unruly land cut off by a canyon-- miles upon miles long, wide, and so deep no bottom can be seen beyond darkness-- known as the Chasm, and the west where the majority of packs reside, open and variable, circled by an impassable mountain range called The Fringe. North and south lead to oceans, and passed those seas... well, who knows. A vast amount of biomes and creatures alike have grown and thrived within these borders. While there is evidence of previous human habitation - the ruins of ancient civilizations dot the landscape, and a surviving nomad may be found here or there - the Straits are largely dominated by various species of wolves and their kin. Beyond the Fringe and over the Chasm exists only an uncharted realm, a mysterious and foreign world said to give birth to an impossible array of beasts and monsters... some truly beyond the imagination. Some who have gone Beyond claim to see gigantic hellions, roaming the horrible wild, and hear deep, hungry, luring whispers from the canyon's depths. While most agree such stories are nonsense meant to scare pups from venturing too close to the predator filled mountains or the giant scary hole, the overall opinion is that it's safer to stay on this side. Similar to our own world, the species of the Straits evolved and developed into familiar branches. Wolves, sabres, lions, and foxes all found a niche in which to reside, and dogs were domesticated and bred by man alongside them. When an environmental catastrophe threatened to destroy the lands they knew, an ice bridge was discovered - one that lead to the safety of the sheltered Straits. When the bridge melted, the animals remained, and over time this distant history was forgotten. The Straits’ residents were there to meet them. Massive Fringe dire wolves had evolved in the deserts and mountains. The Fringe itself created hellbeasts, mutated and strange versions of already-existing species, that occasionally crossed over the mountain range separating them and mingled freely with the Strait’s inhabitants. Humans rose, then fell, and became all but extinct, leaving only pieces of their culture behind - and with no single dominant species, the creatures of the Straits have evolved high intelligence alongside them. What has followed is a struggle for survival between dangerous apex predators in a land that was never meant to support them, which has lead to several strange aspects of evolution. The first migrants across the ice bridge founded the wolf pack of Inaria and established a breeding program with the larger Fringe dire wolves in an attempt to create an elite rank of guards and warriors. It backfired: the program revealed a genetic flaw known now as the Fury, a trait that sends the affected wolf into a vicious and violent state when triggered. There are several variations of the strain, some being more severe than others. The most common is as follows: when grievously injured or under great pressure or stress, the fury may activate without warning or control: the wolf enters an altered mental state in which they can no longer distinguish friend from foe, instead lashing out violently at anyone and anything within reach. They may blindly fight through physical or emotional pain for its duration, but will quickly fall victim to its energy intensive requirements, and collapse where they stand. An affected wolf may spend the majority of his or her life asymptomatic, and must carry two copies of the gene for it to be expressed. Wolves with only one copy of the gene may unknowingly pass it on to children, leading to its seemingly random reappearance in future generations. Wolves and other carnivorous mammals of the Strait have also developed more flexible shoulders, forelimbs, wrists, and front "toes", allowing them to grasp, gesture, and manipulate simple objects. This leads to a system of crafting and technology that would otherwise be impossible; while delicate work may require more dexterous hands - a human or monkey could do the trick - most carnivores are more than capable of rough craftsmanship on their own. Simple creations like baskets, pouches, jewelry, and poultices are not uncommon; crude leather armor or intricate projects are certainly possible. The knowledge of crafting is not universal - much like in our own world, some individuals are better suited to it than others - but all characters can benefit from the flexibility and dexterity that this evolutionary trait allows. No permission is needed for a character to have dexterous paws, but questions on what your character can or cannot make can be directed to the Forum Guardians. The creation of hellions has been lost to time, but the vast majority seem to originate from beyond the Fringe - the inhospitable and hostile land outside the western side of the strait, past the mountainous Wall of Teeth. Hellhounds - wolf-like beasts - seem the most common, though mutated and monstrous versions of most every species, prey and predator alike, have been seen and categorized as a hellion. It is thought that the hellhounds were once more uniform in appearance, but after a cataclysmic natural disaster decimated their population and their homeland, inbreeding and territory changes saw a surge of more grotesque mutations and varied genetic information. As it stands, new mutations seem to crop up out of the blue and without warning, though there is some predictability along family lines. They can breed freely with their related species - hellhounds with wolves, hellhorses with horses, etc - though litters are usually small. Crossbreeding and competition is seeing to the slow decline of the hellhound population in particular. Individuals from beyond the Fringe are often disparagingly referred to as fringeborn, a slur that can imply they are savage, feral, or uncivilized. Hellhounds and other hellbeasts have a varied creation process. Standard mutations (known as “traits”) can be used without moderator approval and are found here. More complicated mutations must be reviewed by a moderator prior to approval, which you can read about here. Naysayers be damned, there truly are giants roaming hidden pockets of the wild. In actuality, these enormous creatures are hellions, granted longevity by their old blood and are the last surviving strands of an ancient and terrible world. They are extremely rare and generally do not care for the daily lives of the smaller races. Their temperaments usually range from mild curiosity to active disinterest, but there's the odd occasion where they may interact with the lower world. Giant hellions are strictly NPCs. They cannot be made into player characters, cannot have any banned traits (such as working wings on an animal that would otherwise be unable to fly), cannot hold ranks in packs, and cannot be used in combat. They're just something neat for your character to run into! Giants can be based on any animal existing after 10,000 BC. Written by Corgwyn in partnership with Rip (history), Vana (hellhound info), & Silokk (pixels). The following is a list of areas and features found in the lawless In Between, territory existing outside the packlands and owned by no one. If you would like to suggest something new, you may do so in this thread. Not all landmarks will appear on the official map, but they're still a part of our world and may be used by anyone. 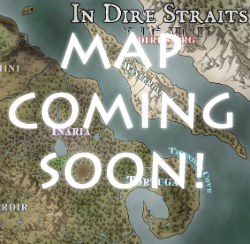 The Dire Strait :: The main feature of the IDS world, the Dire Strait divides the eastern and western lands. It's dotted by islands, both large and small, and freezes in some sections during the winter. These floating chunks can form bridges to the other side, giving some insight to how the inhabitants settled there in the first place. Winterfell Island :: The largest island in the strait, prone to snow and ice in the winter. It's a tough place, and the people living there are even more so. The Fringe :: A border of terrible, sharp mountains that circle the western land. Fringe Dires and Hellions are said to have come from and over its treacherous peaks. The Fringeborn Pass :: The only known, safe passage to and from Beyond the Fringe. "Safe". The Wall of Teeth :: The southern section of the Fringe that stretches to the ocean, an especially thick and ragged part of the range. Ancient Forest :: A very old forest. Of course. Silver Mountains :: Snow tipped mountains known for dangerous blizzards and storms. Roaring Mountans :: Mountains known for their big cats. Red Mountains :: Dry, dusty, hot, and... well, red. Thunder Cove :: Named for violent waves slamming into the rocky landscape during storms. When they strike the seacaves, your ears will definitely start ringing. Onyx Pass :: The territory surrounds an old volcano (dormant) and is lined with tunnels. It forms a small valley filled with clear water, a few trees, but a lot of grasslands. Bigger migrating prey animals have to pass through, and it's a good choke point for nomadic packs to get some game. The Chasm :: A very long, very wide, and very deep canyon that acts as a border to the land East of the Dire strait. Forest of Ash :: A forest of petrified wood, a last reminder of some terrible disaster. Northern Sea :: Cold and turbulent, the northern ocean often brings sheets of ice and the colorful, dancing auroras in the winter. Its shores are usually rocky. Southern Sea :: Warmer than the North, the southern sea is sparkling blue and teaming with vibrant life. These packs were created specifically so other people could use them for plots and backstories, generally located Beyond the Fringe or Over the Chasm. You may play characters originating from NPC packs without getting permission from the creator/alpha, though creators may ask to be notified so they can keep track for their own records. You should not do anything with these groups that would stop others from using them or drastically change how others would use them without consulting the person who made them, however. I.E., killing the alpha, destroying the pack, making royalty, or changing the setting. Don't break the forum's toys! If you'd like to add a pack to the listing, you may do so in this thread.